The newborn hearing test is a non-invasive test that screens for possible hearing problems in newborn babies. The test can be used for premature babies and for term infants. 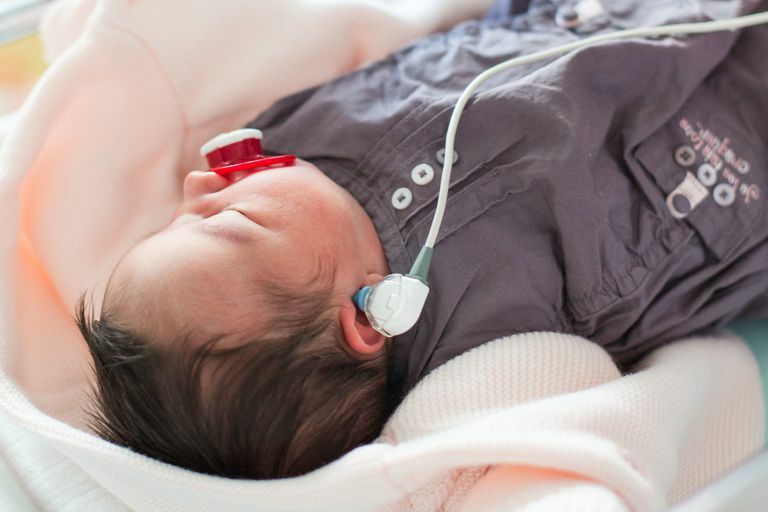 Otacoustic Emissions (OAE): During an OAE test, a small earphone is placed in a baby's ear. A sound is emitted, and the otoacoustic emission that the ear produces (like an echo) is measured. Auditory Brainstem Response (ABR): During an ABR test, headphones are placed over a baby's ears, and electrodes are placed on the baby's head. Sounds are played into the earphones, and the electrodes measure the brain's response. At this point, both the OAE and ABR tests are considered to be reliable tests to screen for hearing loss in well babies. The ABR test is recommended instead of the OAE test in premature babies and babies who spent more than 5 days in the NICU, as it may detect certain types of hearing loss not found by the OAE test alone. Prematurity: Premature birth (birth before 37 weeks gestation) is a risk factor for hearing loss. Low Birth Weight: Babies born weighing less than 5 pounds, 8 ounces (2500 g) are considered low birth weight infants and are at an increased risk for hearing loss. Medications: Some medications used in the NICU can harm the ear, particularly, antibiotics like gentamicin. These medications may be used in preemies or in NICU patients born at term. Jaundice: Severe jaundice increases a baby's risk for hearing loss. Premature babies have severe jaundice more often than term infants. Infection: Babies have an increased risk of hearing loss if their moms had an infection in the uterus or amniotic sac before delivery. Babies who have been diagnosed with meningitis or other types of infection are also at an increased risk for hearing loss. Although it may not seem like newborn babies are great listeners, it is very important for hearing loss to be detected early. Historically, children with the severe hearing loss had language difficulties that affected how well they read, spoke, and interacted with other children. They had developmental delays and emotional troubles. When hearing loss is detected by 3 months of age and treatment begins before 6 months of age, children with hearing loss fare much better. They meet more developmental milestones on time, do better in school, have fewer emotional problems, and learn to communicate more effectively. What Happens If My Baby Fails the Hearing Test? It's important for parents to remember that the newborn hearing test is only a screening test. A baby who "fails" the test is not automatically diagnosed with hearing loss. Instead, a baby who does not respond as expected to the hearing test should be referred to an audiologist or otolaryngologist (ear, nose, and throat doctor) for further testing. That's why doctors and nurses don't say that a baby "failed" the hearing test; they say that he or she "referred" in one or both ears. If your baby is referred, talk to your pediatrician as soon as possible about scheduling an appointment for follow-up testing. An audiologist or otolaryngologist can provide more sophisticated hearing tests to help you figure out exactly where your baby is having trouble and can help you obtain the treatment your baby needs. American Academy of Pediatrics Joint Committee on Infant Hearing. "Year 2007 Position Statement: Principles and Guidelines for Early Hearing Detection and Intervention." Pediatrics October 2007; 120, 898-921. D'Agostino, RN, MSN, CPNP and Austin, Laura MS, CCC/A. "Auditory Neuropathy: A Potentially Under-Recognized Neonatal Intensive Care Unit Sequela." Advances in Neonatal Care December 2004; 4, 344-353. National Institutes of Health. "Has Your Baby's Hearing Been Screened?"